Lauren Carey, at middle, chats with the Most Rev. Sam Candler as Arlene Conner, at rear, signs a copy of a letter to Mayor Kasim Reed. Managers of several Atlanta farmers markets are asking customers to voice support for the markets as they negotiate with city officials over regulations on the markets and their vendors. Carey said existing regulations apply to parades, street closures, concerts or festivals. Although she said the farmers market is “very festive,” it does not fall into any of those categories. 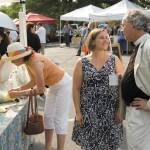 The Peachtree Road Farmers Market is scheduled from 8:30 a.m. until noon every Saturday from April to mid-December. It operates in the parking lot of the Cathedral of St. Philip at Peachtree and Rumson roads. In three years, the market has grown to over 30 vendors of locally produced organic food products and other locally produced items. It attracts approximately 1,000 customers each week. She said vendors who sell live plants and candle-makers also are licensed. A coalition of market managers representing groups on Peachtree Road, in the Morningside Market, East Lake and East Atlanta Village neighborhoods, as well as the new Swoon Market are working with city officials, she said. 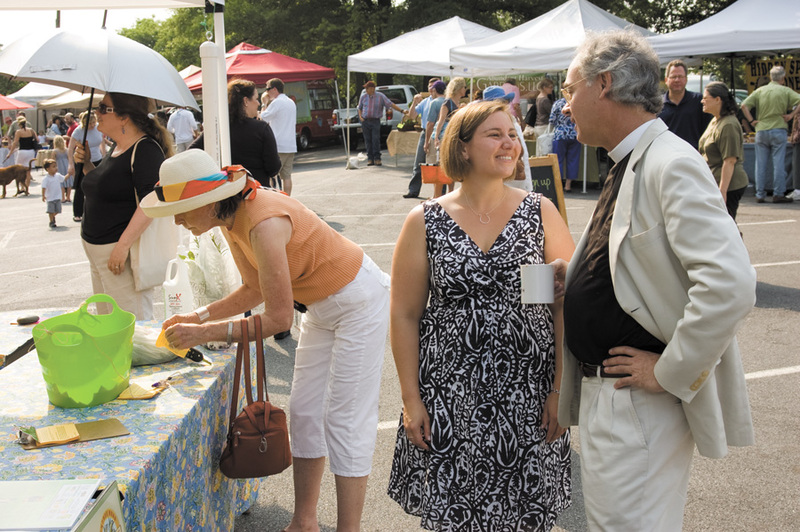 The Most Reverend Sam Candler of the Cathedral of St. Philips, who greeted customers on May 15, said he considers the market a way the cathedral serves its neighborhood. “I think everybody is trying to do the right thing,” he said. “It appeals to goodwill and good faith here and our whole market is about good faith. I think we are trying to be responsible and the city is trying to be responsible. I think we can work something out. I am writing you as a constituent to ask for your support in ensuring that local farmers markets are able to operate in our city. I appreciate the support your office has provided as your administration seeks to create a space for farmers markets in the city policies. I ask that the city not place undue burden, financial or otherwise, on our farmers markets as the policies are being drafted to govern their activities. Text of letter people are asked to sign and send to Mayor Kasim ReedDear Mayor Reed and city government leaders:I am writing you as a constituent to ask for your support in ensuring that local farmers markets are able to operate in our city. I appreciate the support your office has provided as your administration seeks to create a space for farmers markets in the city policies. I ask that the city not place undue burden, financial or otherwise, on our farmers markets as the policies are being drafted to govern their activities.